Lake Oroville is dropping a tad more than a foot and a half a day now. The current elevation is now officially below 800 feet at 799. The good news is the bass fishing is still pretty darn good. Reports coming into Fins, Fur and Feather Sports (FFF) are all encouraging. Most anglers are still able to boat 30 bass per outing, albeit very few over two pounds. 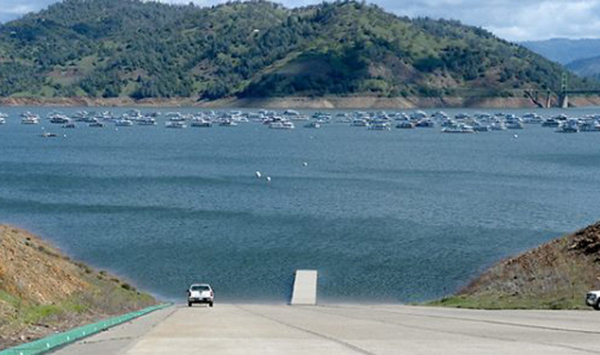 However, this is standard Lake Oroville; quantity not quality. The early morning topwater bite is on right now. Everything from Spooks, Pop Rs and buzz baits are working. Don’t be afraid to throw frogs here also. You don’t need a moss bed to catch bass on these killers. Work them around vertical walls and bridge pilings. As the sun starts to hit the water, switch over to spinner baits for a while. I have found the best method for throwing spinnerbaits here is to work your boat parallel to shore about 20-30 feet out and keep your trolling motor on low. Throw out in front of the boat next to shore and burn it back to the boat. Just keep putting along until you get a fish, then stay in that area for a while throwing Senkos, Gitzits or drop-shot rigs. Think of blade bait as a hunting tool. For all you late risers, fear not; you can still catch your fair share of bass with wacky-rigged Senkos, Old Ugly tubes and Keitech swimbaits throughout the day. I have heard no credible reports on trolling for kings lately. Last person with whom I spoke was doing well trolling chartreuse or orange wedding rings at about 60 feet deep in front of the dam area. Several reports on the salmon said jigging with a white crappie-type” jig up in the West Branch brought several to the boat. These reports are several weeks old. Drop by FFF Sports for up to date reports and all your tackle needs. It is located at the ntersection of Skyway and Clark Rd. in upper Paradise. Call them at 530-876- 8800. They have a full selection of lures, worms, sardines, minnows and frozen anchovies.